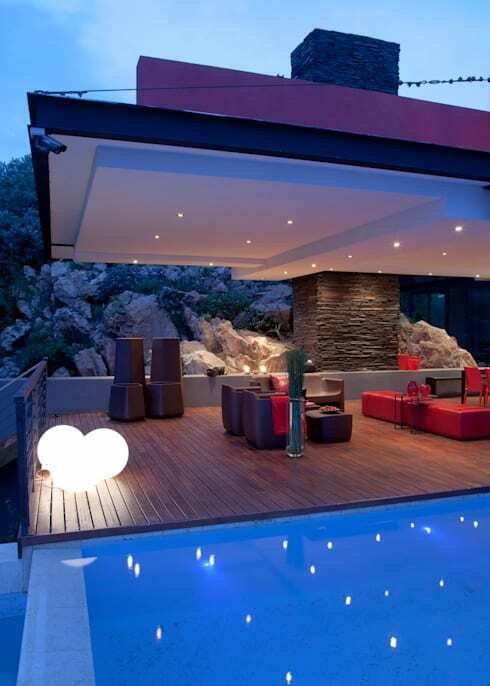 Welcome to the House Lam, another project from the South African architects, Meulen Architecture. 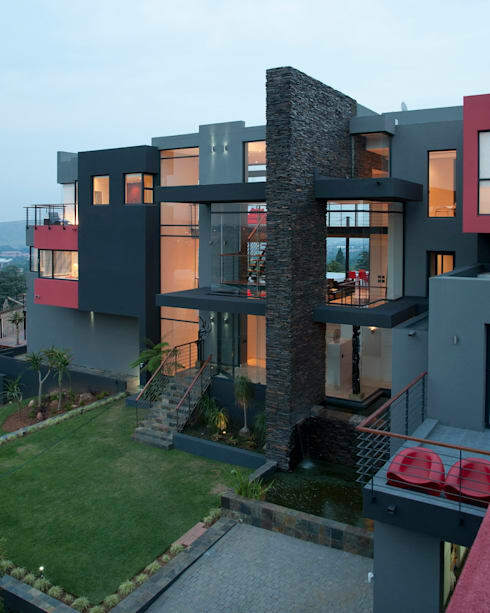 This modern masterpiece is located in Bedfordview, Johannesburg, and is sure to create a renewed interest in contemporary South African architecture. Although this house of spectacular dimensions has many distinguishing design features, the main draw of the project is its location. 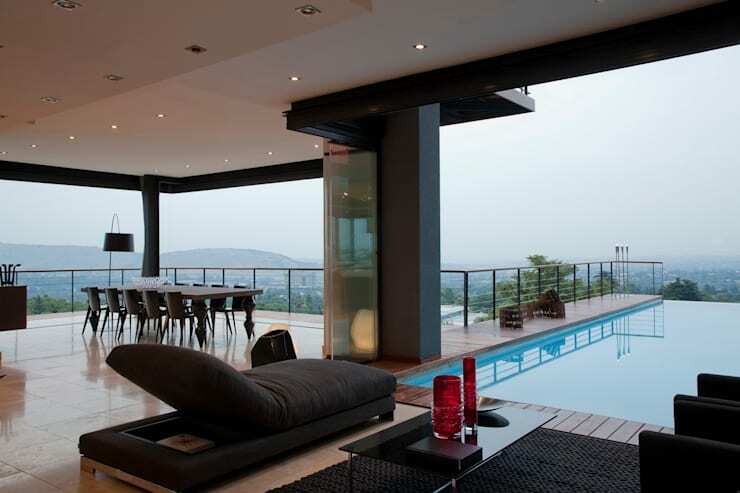 The house is situated on a rocky outcrop with a breathtaking view of the city of Johannesburg. Indeed, you will see as we move through the spaces in the house, almost every room has an unbelievable panoramic view that is sure to transfix you for ours. Intrigued? Well, let's not sit around here, we have a lot of ground to cover! We start of our tour today in the master bedroom of the home. This is a bit of an unusual starting point for a 360 degree view of a project, but the room is so spectacular, we could simply not resist just jumping in here. As we can see in this image, the house is perched very high on a hill, offering extraordinary views of the surrounding territory. 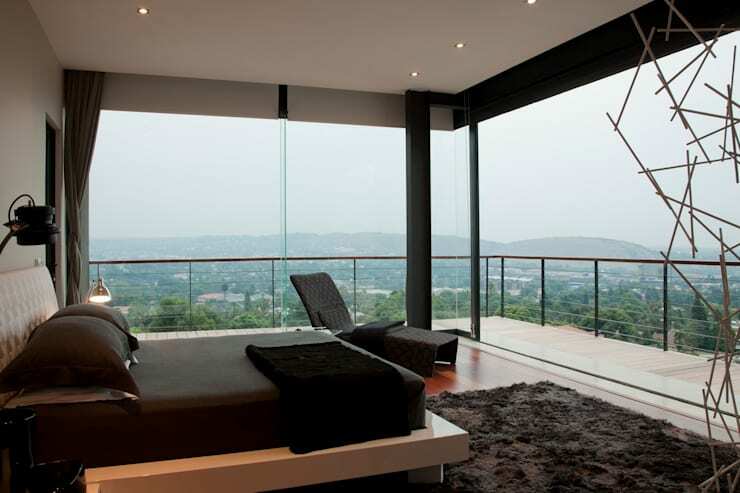 The master bedroom, situated on the top floor of the house, is privilege to this extraordinary view, and in order to take full advantage of this, the room is enveloped in glass all-round. This allows for a panoramic view right from the bed. In relation to this, the furnishing and decoration of the room is otherwise minimal, in order not to take away from this scenery. Now here we have a view of the house in its entirety from the outside. It is certainly a very impressive structure. A skillful composition of steel, stone and glass, the building was designed to maximise the surrounding views of the property. This is very effective here, as the architects make full use of the natural features of the environment without compromising the architectural flow of the structure. The masonry we can see here in the facade adds a beautiful, rustic touch to an otherwise wholly modern design, which makes for a delightful eclectic ensemble. The splashes of red here on the exterior is significant, as it is a colour scheme that will be continued in the interior of the home as well. 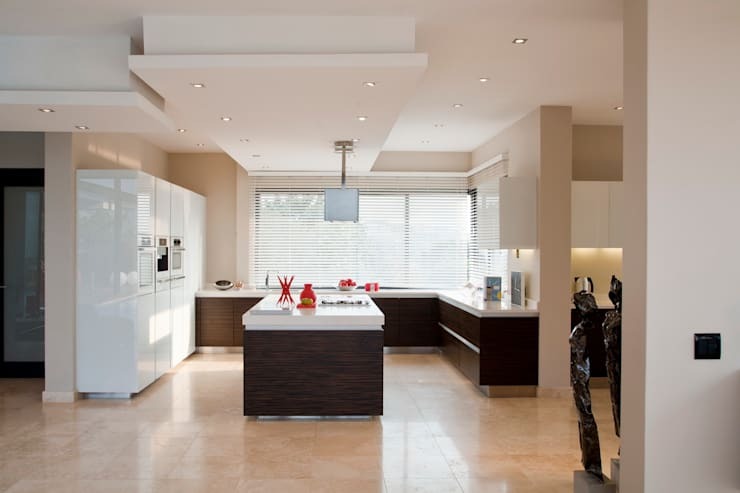 Now let's see what's cooking with the interior spaces other than the bedroom, and appropriately, we will start with the kitchen. The kitchen is situated on the ground floor of the building, which is a large open-plan living area that stretches out comfortably onto a lanai and swimming pool deck area. As we can see from the generous space around this kitchen area, it is clear that it forms part of a much larger and open floor plan. The kitchen design itself is classic and uncomplicated—exactly what you would want in a sophisticated and minimalist modern home. The stone floors set a natural, soft ambience for the space, whilst the white kitchen counters and wall storage ensure clean working areas. This is all neatly divided by and contrasted with the dark wood cabinets. Now, let's move back towards the stunning view. It is simply magnetic! We can see why the architects used so much glass in the home's design, you simply cannot keep such scenery away from admiring eyes for very long. Here we find ourselves in a lounge area which opens up onto the swimming pool. The perfect place to spend weekends with friends and family, or just to take some time out for yourself and unwind by the poolside. The furnishing and decoration in this area is also simple and elegant, tuning in well to the rest of the interior and exterior's colour scheme of greys with splashes of red. A luxury pool chair is found right at the edge of the pool, yet still under the shelter of the main building's roof. This is an excellent example of indoor-outdoor integration. We leave you with an image of this supreme entertainment area found on the lanai next to the poolside. The flooring here consists of a wooden deck, which is the ideal look for the function. The very spacious area also provides room for luxury outdoor furniture, which is perfect for entertaining. With the addition of moody lighting and the privacy provided by the rock face at the back, this must certainly be the place to be for neighbourhood parties! The pool, which we can't see in its full glory from this picture, is actually cantilevered, which makes its design that much more interesting and impressive. The ground floor spaces were all designed around this custom feature, and we can certainly see why the architects would choose to do so. For another home that boasts a swimming pool well worth noting, head on over to this great ideabook about this: Stunning Portuguese Villa. What did you think of the spatial division in this home?